UPDATE December 10, 2015: Damian Shiels has produced a detailed analysis of the 69th New York men captured in this fight. On this date 150 years ago, General William Mahone was up to his old tricks at the Siege of Petersburg, inflicting an embarrassing defeat on two New York regiments manning the skirmish line in front of Fort Davis southeast of Petersburg. As night fell on October 30, 1864, the famous 69th New York of the Irish Brigade and the 111th New York were manning the picket posts in front of Fort Davis, just west of the Jerusalem plank rod, with the pickets of the two regiments forming the left wing of the picket line for the Consolidated (2nd and 3rd) Brigade, First Division, Second Corps, Army of the Potomac. 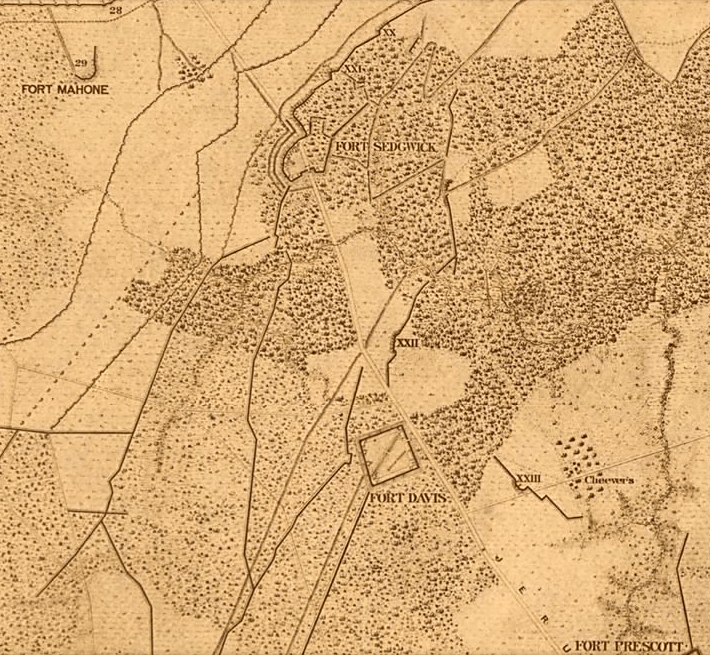 The 69th New York was on the right, with most of its men west of a ravine, its right connected to the 63rd New York, another regiment of the famous Irish Brigade. The 111th was on the left, the far left regiment in the entire Second Corps line. They were responsible for the connection with the right most regiment of the Fifth Corps. Near the scheduled picket relief time, as Mott’s Third Division came back from the Sixth Offensive and took over a part of this area’s lines, the Federal pickets saw blue jacketed men coming in from the rear. They naturally assumed these men were from Mott’s Division, coming to relieve them. Unfortunately for them, the Union soldiers were wrong. Several days before, ten or so men who had just been conscripted deserted from the 69th New York and entered Confederate lines. Mahone had them interrogated and found them to be quite talkative. He learned the setup, force, and relief schedule of the Union pickets on this area of the front, using it to his advantage. I have been unable to find specifics, but based on Union reports and other clues, the assault was almost certainly made by a sharpshooter battalion from one of Mahone’s brigades manning this portion of the lines. 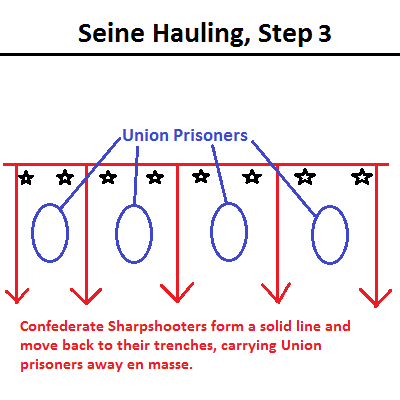 The biggest clue involved the use of “seine-hauling,” a favorite tactic of the Confederate sharpshooters. A seine is a fish net, and when held by two people it allows them to drag the net toward shore and trap any fish unlucky enough to get caught. In this case, the Confederate attacking column was the seine and the Yankee pickets were the fish. Before we go further with the narrative, let me digress just a bit and give some diagrams of a typical seine-hauling expedition. First: Confederate sharpshooters form two long columns with very narrow fronts side by side. This column is to rush quickly and silently between two Union picket posts. Second: Once through the Union picket line, the Confederates spread out left and right to form a line, and face BACK toward their own lines. Third: At a signal, all of the Confederate sharpshooters rush forward, heading back to their lines, surprising and capturing many Union pickets while coming from an unexpected direction. Got it? Good, because you’re about to read about a nearly flawlessly executed seine-hauling operation, which is why it is extremely likely one of Mahone’s sharpshooter battalions was involved. For more on seine-hauling and the Confederate sharpshooter battalions of the Army of Northern Virginia, see Fred Ray’s excellent book Shock Troops of the Confederacy. Between 7 and 8 p. m. on the evening of October 30, 150-200 Confederates slipped between two picket posts of the 69th New York, and began to fan out to net a bounty of Federal prisoners. This force was about the size of a typical Confederate sharpshooter battalion at this stage of the war. Second Lieutenant Hoff of the 111th New York was in command of that regiment’s Picket Post 1, the rightmost picket post of the unit. He saw what he thought was his relief coming on from the right, but noticed they were wearing gray pants. Hoff, instead of informing Picket Post 2 to halt and challenge, as was proper protocol, went rearward to tell his superior officer. As a result, the picket posts of the 111th New York fell like dominoes down almost the entire line, each thinking these men were the relief pickets rather than the enemy. The 69th New York didn’t fare any better, and it could have been even worse. Lieutenant Murtha Murphy, commanding one of the 69th’s picket posts, heard and challenged the oncoming Confederates heading north to scoop up that regiment’s line. As a result, he probably prevented the capture of the entire picket line of the 69th. Before the Union officers on the main line knew what had hit them, most of the pickets of the 111th New York and the 69th New York had vanished, scooped up neatly by the veteran sharpshooters and carried quickly back to the Confederate lines. The 69th New York lost 164 officers and men out of 230 on the picket line that night, with the 111th New York suffering 82 captured out of 161 total men on the picket line. The Confederates had scored a small but real victory that night in front of Fort Davis with little to no loss, one of many such small fights carried out during the nine month siege. In the days following the disgraceful affair, Union senior commanders wanted to know what had happened. Division commander Nelson A. Miles instructed Consolidated Brigade commander Colonel Clinton D. MacDougall, to investigate. Fortunately for historians, many of the resulting reports back to MacDougall regarding the affair are included as inclosures to his final report. Ultimately, it was thought that the deserters from the 69th New York had either been Confederate spies or simply gave the Confederates all of the information they wanted. 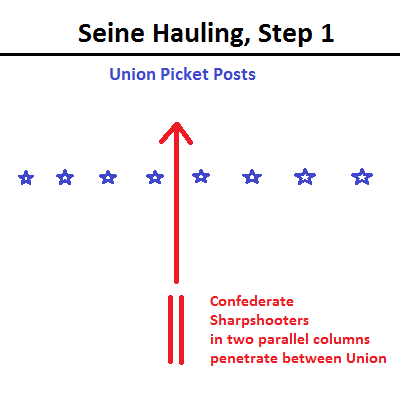 The Confederate attack was designed to mimic the Union picket relief setup, and it worked beautifully. Combine that with the by now refined Confederate sharpshooter practice of seine-hauling, and the end result occurred. Still, it didn’t have to end this poorly. MacDougall believed that if Lt. Hoff of the 111th New York had done his job at Picket Post 1, the disaster would have been averted and the tables might have even been turned on the Confederates. In the end, his failure to follow protocol made an already tough situation infinitely worse for the Union men on the picket lines that night. Lastly, many of the men in the 69th New York were brand new, and this was also considered a major factor in the end result. If anyone has any details on what happened to the unfortunate Mr. Hoff, or if you know of any magazine articles on this short little affair, I’d love to hear from you. I enjoyed this post on the capture of pickets from the 111th New York. Researching this event was what led me to write a history of the regiment, which was published in 2010. In the book, I cover the event in detail, as well as following the prisoners through their captivity in Appendix A. The issue of seine-hauling is the first I’ve heard this theory put forth. One of the pickets lucky enough to escape as he was being herded back to Confederate lines wrote to his wife about being put into a hollow square with the rest of the captors. Additionally, I did come across a reference to the attacking Confederates being part of the 8th Alabama, but I was unable to corroborate that nor was I able to positively place that regiment on the battlefield at the time of the capture. Therefore, I chose not to include that detail in the book. What became of Lieutenant Hoff? According to his letters, he seriously considered resigning his commission and leaving the army. He felt very heavily the weight of responsibility for what happened. But, even against the wishes of his wife, he remained with the regiment until the end of the war. Upon his muster out, he returned to his wife and four children, and his work as a brick mason. Thanks so much for writing in. 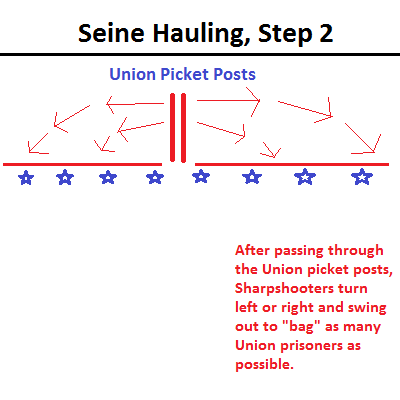 The origination of the idea of “seine hauling” is definitely not mine, and I want to make sure the credit goes to fellow TOCWOC blogger Fred Ray for bringing this to my attention. Fred wrote Shock Troops of the Confederacy, about the Confederate sharpshooter battalions in the Army of Northern Virginia. I *think*, because I’m not sue and not near the book right now, that Dunlop’s book on Confederate sharpshooters in 1898 or 99 is where the idea was really placed in print for the first time. Thanks also for these additional details. I do have your book, but in the press of time in trying to get 150th posts out there, I didn’t think to check. Had I done so, I would have had my answer! 🙂 This brings up a good point. For anyone looking to study these smaller skirmishes and actions, one of the very best places to go for information is the regimental history of a unit involved. It wasn’t “small” to them.